Cicily here with a quick, just one tip for you today. If you like to peruse second hand stores, chances are you come across your fare share of metal file cabinets, usually at a steal! 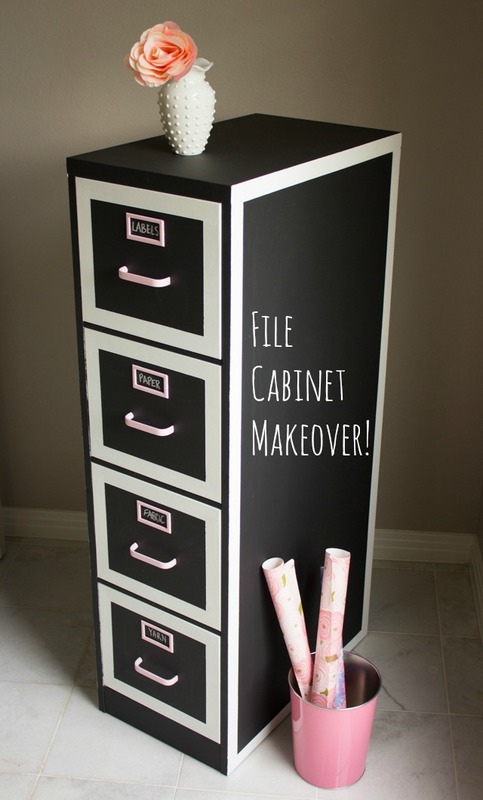 Why not give it a makeover and turn it into craft storage? Here’s a cute one with an entire tutorial for the chalkboard makeover at Design Improvised. This is my final post with CSI. I’m going to miss posting for you all but I feel after 2 years it’s time for me to move on. Thank you so much to all you crafty organizers! Hello readers, Kim here to share my January Just One Tip for storing the crafting tools that you use everyday with a flea market find! My tip: Find something that you love to hold all of the everyday tools and keep it on your desk right in front of you within easy reach. One thing that I’ve learned about myself is that if putting things away is work or if my tools are stored together like jigsaw puzzle pieces, it won’t work for me. It needs to be quick, handy and within reach. My solution came while browsing a local flea market…a small wood caddy. I’m not sure what it was originally used for. It looks like one of those men’s dresser caddies to hold their wallets and watches. This is perfect for my needs. It holds all of my tools, I like how it looks and it doesn’t take up a huge amount of space on my craft table. The crafty gal in me loves to re-purpose items that I find at flea markets, garage sales and thrift stores. This little caddy will become another DIY project when I finally decide how I want to paint or decorate this. I know that I will paint it with a white base, but I’m trying to decide whether to paint a design on the front or perhaps I’ll use my Mod Podge to add some designer paper with a pattern that I love. I would love to hear your ideas and suggestions for how to refurbish this wood caddy to decorate my desk and hold my tools! Please leave a comment below to share your thoughts! Until next time, let’s make 2015 the year we get our craft stash organized!